Podcast statistics unveil a lot of truths about modern consumer behavior and the rise of audio as a content marketing avenue. This year, I’ve pulled out 13 of the most interesting facts about podcasting from The Infinite Dial research. You’ll find even more in the full report. This research was conducted of Americans, ages 12 and up, and was balanced to be a representative sample of age, gender, location, and ethnicity. If you’re a podcaster, this number may actually seem small to you. But, compared to 2017, millions more Americans are now familiar with podcasting. And more Americans know what a podcast is than know who the Vice President is. That’s 124 million people overall, and up 12 million in just one year. For reference, 124 million people is approximately the combined population of New Zealand, Ireland, Costa Rica, Norway, Finland, Denmark, Nicaragua, Switzerland, Australia, Hungary, Sweden, Portugal, Greece, Belgium, Chile, and Hong Kong. That’s a lot of podcast listeners! That’s up from 24 percent in 2017, and represents 73 million people. For context, 21 percent of Americans are Catholic. Thus, podcasts are more popular than Catholicism, in some respects. 32 percent of Americans in this age range listen at least monthly, slightly more than Americans 12–24 (30 percent), and quite a bit more than older Americans. Among people in the United States aged 55 and over, just 13 percent listen monthly. There’s still a lot of growth potential within this older segment. 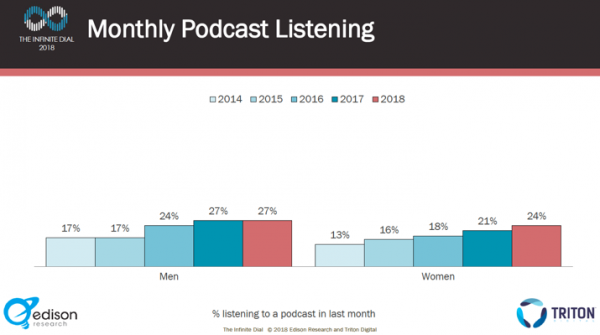 Between 2017 and 2018, monthly podcast listenership among male Americans stayed flat, at 27 percent. The growth in podcasts in the USA is coming from females, showing an increase from 21 percent to 24 percent in monthly listenership. This is a 14 percent bump in one year. This is 48 million people total, and up six million from 2017. By any measure, it’s a lot of listeners. By way of comparison, approximately 20 million people watch NFL Sunday Night Football, routinely the highest-rated television program. 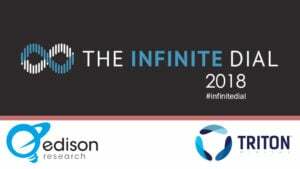 In the 2017 version of The Infinite Dial report, Edison Research found that podcast listeners consumed an average of five different podcasts each week. In 2018, podcast listeners have increased their listening by 40 percent, as weekly podcast fans now listen to an average of seven shows. 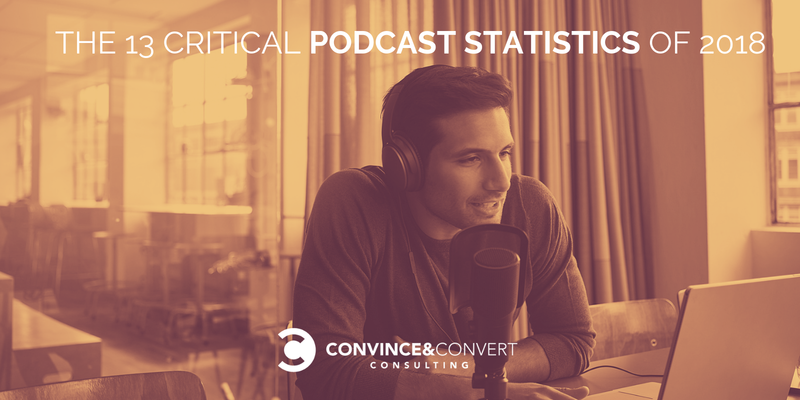 Last year, 85 percent of podcast listeners said they consumed “all” or “most” of each episode they downloaded. This year, that rate diminished to 80 percent. This is perhaps not a surprise, given the increase in number of shows listened to (from five to seven). Podcast fans are downloading more episodes, but listening to slightly less of each episode. This is certainly how I listen to podcasts personally, and the number of Americans who do so moved from 19 percent to 23 percent in just one year. This is powered partially by the increase in mobile listening (see below) and a corresponding boost in the number of new vehicles that have streaming audio and podcasting integration included. This statistic is similar to last year and continues to baffle people (like me) who habitually listen to podcasts in a vehicle. Smart speakers like Amazon Alexa and Google Home are skyrocketing in popularity and are being adopted even faster than smartphones were a few years ago. In fact, between 2017 and 2018, the percentage of Americans owning at least one of these devices soared from seven percent to 18 percent. This means that 51 million Americans now own a smart speaker, possibly contributing to the steadiness in podcast listening at home, given that these devices can play your favorite podcasts with a simple, verbal request. After I bought my first Amazon Alexa, I couldn’t figure out why you would need more than one. I now own three and am getting ready to buy another one. Once you start to get a feel for the tremendous number of potential uses for these devices, you find reasons to buy more, especially because the “mini” units are inexpensive. The ratio of podcast listening on a phone or tablet to podcast listening on a laptop continues to tilt toward mobility. In 2018, 69 percent of Americans who listen to podcasts primarily do so via mobile. In 2015, it was just 55 percent. There are your 13 critical podcast statistics for 2018. Definitely download the entire report. Also, a reminder that I co-host the popular weekly Social Pros podcast, which covers how medium and large businesses handle social media marketing. Convince & Convert also produces The Content Experience podcast, which covers advanced content marketing strategies. And we produce The Experience This! Show, a chronicle of great case studies in customer service and customer experience.